Does anybody know where the tab that matches this video can be found? It is 'El Dron' which is published by Encuentro in 'La Guitarra Flamenca de Pepe Habichuela'. The book has both score and tab FYI. One of the best FdH out there. I still play the main falseta amongst my own FdH as it is so stunning. Also a good place to start learning Alzapua. The scribd document - I only scanned it while listening but it seems to follow the audio/video pretty much spot on. What part does not match? Its seems to be pretty close until after the Alzpua at the top of the second page then after that it is completely different. Sorry but it seems to be following pretty much exactly what he is playing. You'll have to be more specific about the discrepancies - which bars compared to what timestamp of the video etc. The stuff after the alzapua is what he is playing on the video as far as I can see. If you are noticing individual note or position discrepancies, these are a common occurrence in any transcription and IMHO not an indication that the transcription is not of what he is playing; they are just errors or sloppiness of the transcription itself. In any case, maybe I don't understand what you need this for - if it is for learning what Pepe is playing it seems to be perfectly suitable. It's not "pretty close" it's dead on. You might not be used to reading a score with chordal strums written as they do? Look more at the top line for rhythms and such, and the tab more as fingerings. the scribd link is a scan of the book that comes with the Encuentro DVD. The books accompanying the Encuentro DVDs are always transcriptions of the a-tempo/fast versions. So the scribd scan is a transcription of the YouTube vid up to about 5:00. After that is the slow version. Not transcribed. the CD version, the DVD fast version and the DVD slow versions are all slightly different. I have only been watching the slow version which might explain why I perceive a difference. I will listen to the fast version at the beginning of the video and see if it matches the tab better. I have only been watching the slow version which might explain why I perceive a difference. WHAAAT! You should have pasted a "Missing crucial information" alert to your original query! Also, you can slow down video to 50% while keeping the audio at the same pitch as the original, right within youtube. No need for separate "slow versions" anymore. Of course, within VLC player you can slow things down to a quarter of the speed(*) while still hearing the audio; many other apps probably do this as well. (*) The voice in my head quips to me here "--Yeah, to better match the max speed you will be able to play it at"
Well he is playing it super fast and clean. I use Amazing Slowdowner on my IPAD. Works really good for slowing down and looping sections. I can also change the pitch if I want to put my capo on a different fret. Yeah, sorry about the confusion I had no idea the Slow version was not the same. This is my first FDH I am learning. Started with Paco Pena’s Riomar but I think I like this better. Yeah, sorry about the confusion I had no idea the Slow version was not the same. nearly all the great players don't read music and even those that do don't compose on paper or play from written scores. 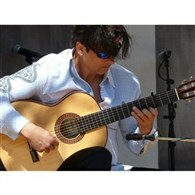 when flamenco music is written down it is transcribed from a performance, live and/or recorded audio and/or video. all flamenco transcriptions are therefore the interpretation of the transcriber, and accordingly more or less accurate. flamencos learn, compose and play by ear, listening and/or watching and listening. I think even non classical guitarists coming to flamenco from another style of music can make the mistake that it is necessary or preferable to learn flamenco from scores or tabs. I think it is probably necessary and preferable to learn as far as possible the way the musicians we admire and look up to and want to emulate learned. That way if you learn from a recording you can't be confused by your score or tab being different! I totally get what you are saying and my teacher has helped me a lot in this area. I have been learning flamenco for 3 years and have made great progress but without this tab it would not be practical to even attempt this piece. I did confirm it does indeed match his playing but as you say it doesn’t convey all the nuances. I have been learning flamenco for 3 years and have made great progress but without this tab it would not be practical to even attempt this piece. I won't try to dictate what you should or shouldn't do, but suggest that if you need a tab or score then it's too difficult for you. (I would recommend Oscar Herrero and Merengue de Cordoba). Now, with the increasing availability of videos, you can check, and correct the tab yourself. 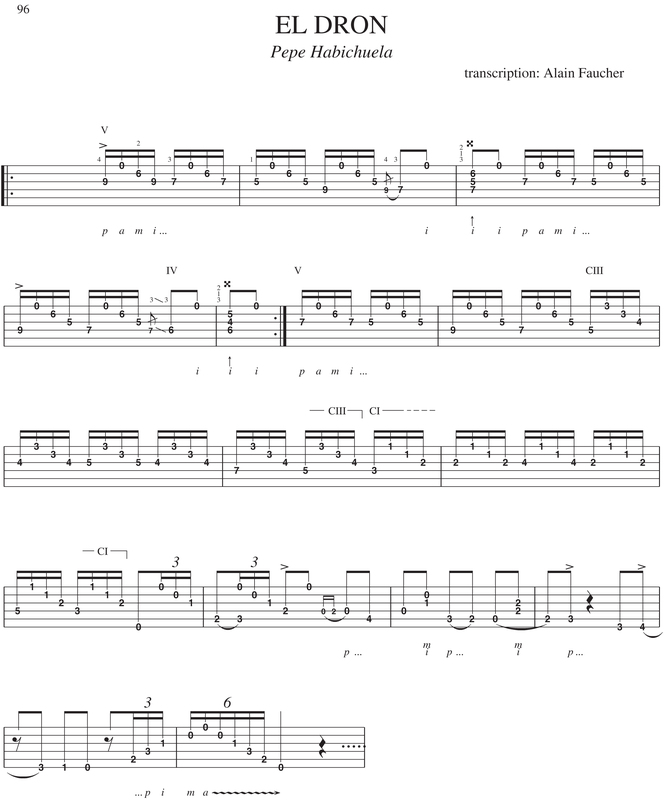 I remember having lessons in Huelva with some local, young guitarists, only to find out that they were using Alain Faucher tabs too! Maybe this is not authentic, but it might be that it’s the best that some people can access? When you live nowhere near a teacher, at least one who can play the music you like, then you need to resort to other methods. undeniable, and I think being able to see how the techniques should be employed by watching a competent advanced player is really important, which is why we have DVD! . I think if you just learn by tab then you won’t get the timing, or sound, but if you combine the tab with the audio then you could get close to being authentic? but if you have the audio, then why not just get the notes from the audio? that way you use and improve you ear, so that you can also tackle anything that you don't have tab for. it avoids the problem of the tab being at best an "interpretation" and at worst plain wrong. a good, experienced ‘tabber’ may have a better chance of working it out than someone like me. imo the only person who benefits from transcribing music is the transcriber. you can use media players and/or software to slow audio or video down, loop small sections (even one note! ), and learn to play the notes as you figure them out. no need to write them down. if you forget then just go back to the audio. it's actually much quicker in the long run than trying to remember tab. I remember having lessons in Huelva with some local, young guitarists, only to find out that they were using Alain Faucher tabs too! I hope you didn't actually pay them? I’m afraid I did, although not much. I learned more by listening and watching them play than copying them. Even learning Flamenco from an audio file is probably a step too far for some people. Instead of at the foot of a maestro! IMHO the aim of every teacher should be to make the student independent of them. So a good teacher should be teaching the student to develop and use their ears, directly or indirectly, not handing out tabs and keeping them addicted to crutches! I have even been at a guitar workshop with a really good teacher, going slowly, explaining things clearly and demonstrating small sections at a time, and there was a guy paying no attention asking me to write it down for him, convinced already that he couldn't do it without trying - madness! And without a teacher you have to do that for yourself, with the help of DVD's and something to slow down audio. I am not great at this, it is a constant work in progress, and sometimes I literally loop one note and slide my left hand finger up and down frets to find or check I have got the note right. Anyone can do it, you just have to try, and persevere!